The Head of the PMB, bishop Josyf (Milyan) and a secretary of PMB, father Andriy Gakh paid a working visit Ukrainian community in Tallinn. After a Liturgy PMB delegation met with a native bishop Philippe Jourdan, Apostolic administrator in Tallinn. During a meeting a question about an improvement of a pastoral care over faithful of UGCC in Tallinn was being discussed. Bishop Philippe was also interested about a situation in Ukraine and assured that his flock is praying for peace in Ukraine. Meetings were also held with a senior priest of Church of a Three-handed Virgin Mary – a Patroness of all innocently insulted - father Volodymyr Paliyenko, the head of Ukrainian community – Anatoliy Lyutyuk and all the faithful. 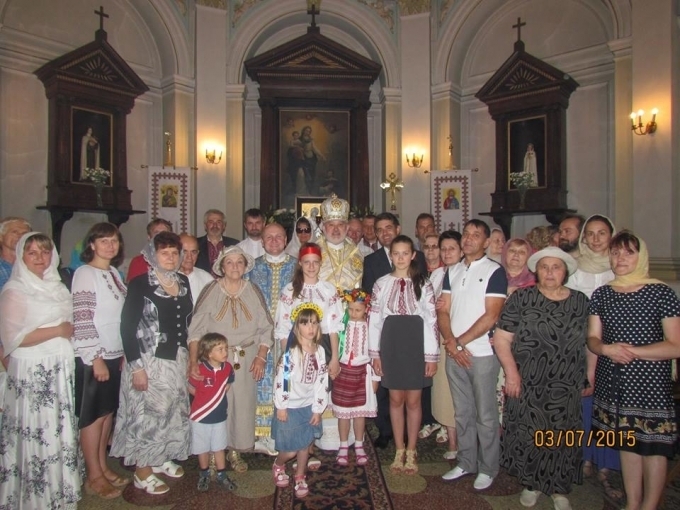 The same day a delegation visited Ukrainian community in Riga, where bishop Josyf celebrated a Saint Liturgy and appealed to a local community with his word. At a Mass was present an ambassador of Ukraine in the Republic of Latvia, Yevgen Perebyinis. After serving a Mass was conducted a meeting with a community, where a situation in Ukraine and arrangements of Ukrainian Church community in Riga, headed by father Roman Sapugzak, were discussed.